Pursuit of Felicity: June Design Work! I know I say this every month but I seriously can't believe the month of June is over already! It was my birthday at the end of May and to me it feels like maybe a week or two has passed since then - certainly not a whole month though! If you've been following my monthly design showcase posts for a while now (and I know some of you have! ), then you'll know that I have worked with Catherine on the design for her awesome blog You Wish You before. This time around though Catherine wanted to work together with an illustrator to create the perfect watercolour portrait of herself that would match the overall theme of her blog for me to incorporate into her new header. Ella Smethurst, a talented Australian artist from Melbourne, Australia (yay! fellow Aussie!) was the illustrator Catherine chose to work with, and oh my gosh was she the perfect choice. Her portrait of Catherine was absolutely stunning and matched the design I had already started creating for her perfectly. 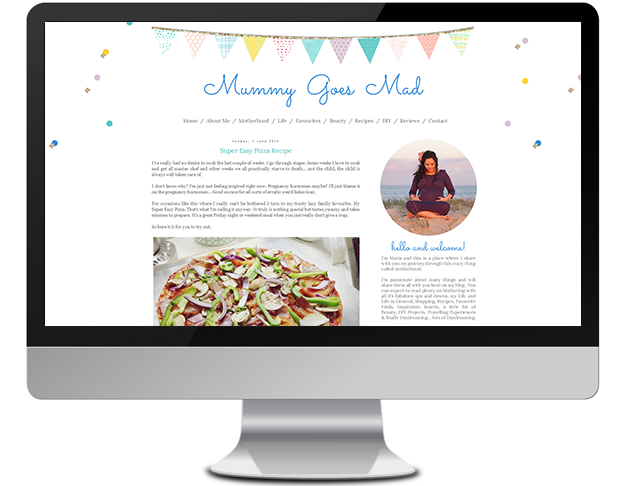 The blog design is soft and airy, very girly and just down right pretty.. definitely one that you guys need to check out live! In case you guys hadn't worked this out already, I am not illustrator by any means. 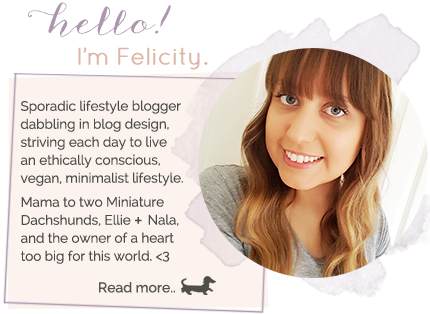 I have a few amazing illustrator contacts that I like to recommend to my clients, but every once in a while when I feel like I am up to it, I like to take on the challenge of creating blog design graphics myself. This was one of those blog designs. 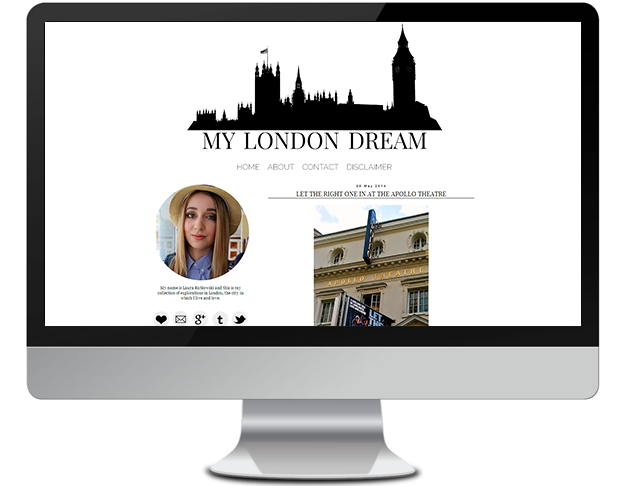 Laura, a talented lifestyle/travel blogger from England, wanted me to create a silhouette for her header of a London cityscape/skyline. It took me forever to find the right stock photo to use but once I'd found it the rest of the process came pretty naturally to me. The finished look of the design is very sleek, clean and minimalist, and easy to read and navigate. If you'd like to see it live, you can see it live here. 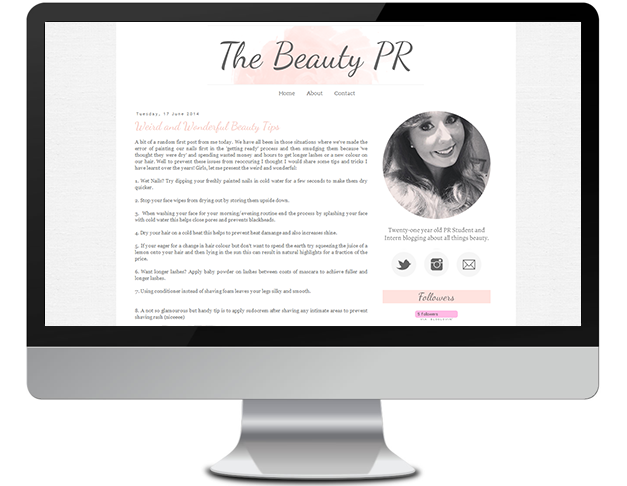 The last blog design I have to show you guys this month is another sleek and clean design for the gorgeous Karina from Blog da Karina Hassen. Karina left most of this design up to me after sending me a few examples of the kind of blog designs she likes, which were classy and chic, and this was what I came up with. I'm pretty obsessed with glitter at the moment so I decided to include a few glitter touches. Karina really seemed to like the glitter and told me to run with it and make her design beautiful, and that's what I (hopefully) did. What do you reckon? Is this design classy, chic and beautiful?